Have you acquired competences that correspond to the learning outcomes and the level of your degree before starting your studies? Or do you have hobbies, or do you work or take other studies that increase this kind of competence during your studies at HAMK? Recognition of prior learning (RPL) means recognising and accrediting the competences acquired elsewhere and prior to your studies. The idea is that you do not have to study something that you already know and your competence will be accredited as part of your degree. RPL may cover entire modules or some parts of modules. Competences may have been acquired in other universities, at work or in hobbies. It does not matter where the skills have been learned as long as they can be recognised and accredited as part of your degree. 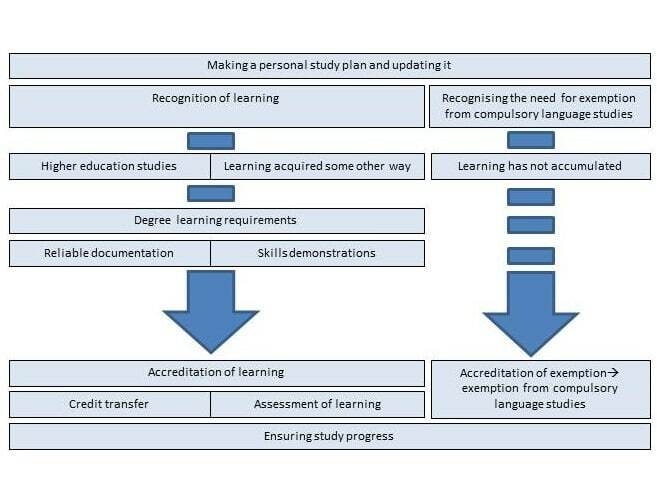 If you wish to have your prior learning recognised, you can start the RPL process (see the picture below). Discuss your prior competence with your student counsellor and learn about the learning outcomes of your degree before applying for RPL. Students play active roles in the RPL process. First, you should recognise your own competences, describe them and compare them with the learning outcomes of your degree. Then you should demonstrate your competence with documentation or by skills demonstrations. Accreditation means that you will gain credits by documenting your competence and doing skills demonstrations that will be assessed. You can start the RPL process whenever during your studies. Remember to bring it up when you recognise a new competence acquired from e.g. work experience during your study time. HAMK students use Pakki for the RPL process. You may start the RPL process by sending a module-related comment to your tutor teacher or student counsellor via your PSP or booking an appointment for a development discussion with your student counsellor. If the discussion leads to an agreement that you should apply for RPL, go to Pakki and fill in the RPL application. Remember to add the required attachments to the application. Please note that you should not use Puro-service with RPL. For more information on transferring credits from Puro, visit the Puro-pages. Students dissatisfied with the decision for credit transfer, exemption of mandatory language studies or assessment of skills demonstration may request a reassessment. In case of credit transfer or exemption, the student will request the reassessment from the decision maker or the teacher who graded the skills demonstration. The reassessment request must be made, in written or spoken form, within 14 days of receiving information about the decision. Such requests may be made orally or in writing within 14 days of being informed of the decision. The student is considered to have received the decision or the grade one day after its entry into Pakki. The staff deals with the requests without delay. A student not satisfied with the decision maker’s reply may appeal to HAMK’s Board of Examiners. A written appeal must be made within 14 days of being informed of the decision maker’s reply concerning the reassessment request. Appeals should be sent to tutkintolautakunta(at)hamk.fi via email or in letter form to the Board of Examiners, Registry Office, P.O. Box 230 (Visamäentie 35 A), 13101 Hämeenlinna. An appeal is deemed to have been received on time when the registered date of receipt is within 14 days of the decision maker’s reply. A written appeal must indicate at least the student’s demands, including reasons, competence name or module name and code, the student’s name, degree programme and contact details required to deal with the issue. The Board of Examiners will deal with appeals without delay. Board members may not participate in dealing with appeals concerning the decisions they have made or the grades that they have given. The Board of Examiners will base its decisions on statutes, HAMK’s Guidelines, the degree’s description of competence and the assessment documentation at issue. The board will provide the persons in question with the meeting minutes that contain the decision on the appeal. Decisions made by the Board are final.